I dont think thats dual monitor. Unless you are on like 800X600 or less and in that case you should be shot. 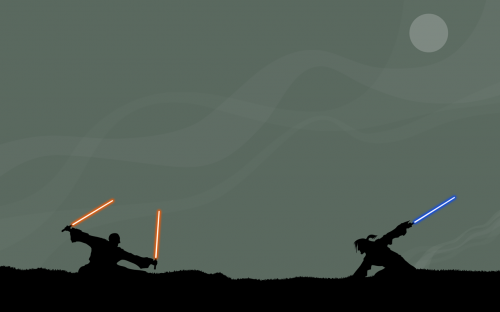 This looks like Anakin’s duel with Asajj Ventress from The clone wars cartoon. The duel is found in episode 19, however, I do not belive this frame is in that episode. Or maby it’s a completly random drawing… I dunno. As for the origin I’ve seen the clone wars cartoons and the silluette (sp) doesn’t look quite right, I’m guessing a picture inspired by that?